My entire life I have hunted the “Big Woods” in rural Elk County in North Central Pennsylvania. I’ve always assumed that in order to see deer you had to go deep into the big woods, the further into the woods, the better. The 2011 archery season started no different for me. Scouting and setting stands in huge tracts of State Forest and State Game lands was the norm. While I had some encounters, deer sightings were few and far between. I passed on a small doe in the early season because i was looking for a big mature buck or doe and I had to do something different. It was time to change tactics and in some cases that means changing locations. My oldest son has a home within the City limits of St Marys, PA. The title ‘City’ does not mean it is all concrete and buildings. St Marys is the second largest city by land mass per square mile in Pennsylvania (second only to Philadelphia). It boasts a population of over 13,000 but density is roughly 134 people per square mile. When you get away from the downtown, there are plenty of wooded patches that connect with much larger tracts of huntable public and private ground. After a few nights of trail camera observation I decided to place a stand near his home. I had always seen deer near his home but after the trail camera showed a good number of deer and a few bucks, including a quality mature shoorter buck, I realized that I needed to place a stand in the area. My Treestand placement was about 100 yards from his house and only about 50 yards from my grandchildren’s play gym. When in the stand, I could clearly three house including my son’s. Still, I was excited about my first hunt in the suburbs. There was a storm front coming and it was preceded by a dark gloomy night and a steady pre-dawn rain. I decided to skip the morning and the bad weather in favor of a rainy afternoon hunt. The forecast called for rain all day but the weather broke and gave me a window of respite from the wet stuff to hunt. It was dark and gloomy but calm and with more rain to come I hustled out to my treestand. It took me less than two minutes to walk from my son’s driveway to my stand. As I sat there, I would look back at my granddaughters play gym and say to myself, ‘this is nuts’. But, I was dedicated to sticking to the plan. Cars were whizzing up and down the road. I heard the school bus make its 3 stops near my son’s house. Neighbors were coming home from work, car doors were slamming and dogs were barking. I thought to myself, “What deer in their right mind would hang around here?” About an hour before dusk, I heard a twig snap. I slowly glanced to the right and saw a very large doe. I remained frozen. Three others were trailing her. I was hoping that the big buck I was after would be behind them but he wasn’t. In spite of all the human activity in the area, they didn’t seem to be nervous. They did keep a close eye trained on the house and their ears were swiveling to listen to what was coming from the neighborhood. The young ones were good sized and must have been born early in the spring. The lead doe, however, was clearly much larger and mature than the others. She clearly had been around a while. Dan Surra with his 2001 Archery Doe kill. 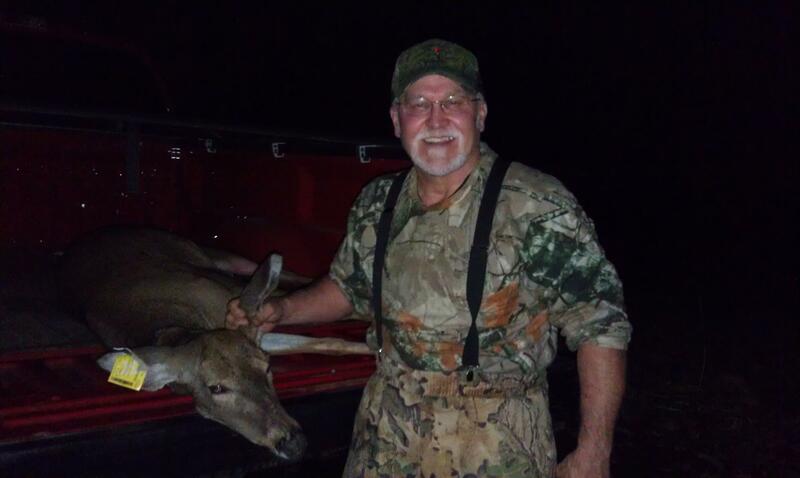 Dan donated the meat from this deer to the Hunters Sharing the Harvest program. helped me drag her up to my truck. It was off to a local meat processor. I had decided to donate the venison to the Hunters Sharing the Harvest program http://sharedeer.org/ and have the meat go to a local food bank to provide food for needy families. The meat processor looked the big Whitetail over and, as I expected, he estimated that she was at least 4 1/2 years old. I guess the moral of this story is not to assume that there aren’t deer hanging around local neighborhoods and don’t be afraid to change tactics. Now, that I have knocked the rust off for 2011 it is time for me to get serious about that big buck that is hanging around the neighborhood. Dan, I grew up in Elk County on a farm along 219. We’ve always seen deer on and around our farm, and most years even heard of a big buck hanging around, but out of the same habit, always scouted and hunted elsewhere. I now live in Durham, NC, which is a good sized city >100,000 people. Two years ago, around midnight the night before Thanksgiving, I hit a 12 point buck less than a mile from my house in the city. About two weeks ago, not 1/4 mi from that spot on the same parkway, a HUGE buck, tall tines and at least 8-10 pts with spread well outside its ears ran across the road in front of my truck at 730am on a Thursday morning. I couldn’t believe my eyes. The place he crossed is a drainage that runs between dense houses on both sides of it. Can’t be more than 100 feet of woods in most spots. Would love to have been sitting on a back deck with a crossbow somewhere along there. That is not really that surprising. I think that because those big bucks learn to adapt in areas that don’t necessarily have a lot of hunting pressure is why they get that large. Hunting on public ground in the North Central part of PA isn’t what it once was and deer sightings as you were once used to have certainly decreased. It is becoming more and more difficult to get young people invloved. Maybe you should consider getting permission to hunt some of those areas. I know my cousins boy got some real dandys in the suburbs of Philly and Washington when he lived there. Thanks for reading Team Surra Outdoors.